There’s been a certain amount of trumpeting about the first opportunity for those of us who read only in English to enjoy a novel by Nicolai Houm, the Norwegian author of several works including a children’s book and a whopping 700-page saga called The Hopeful which has prompted him to be compared to Don DeLillo. What few of the reviews tell you, however, is that The Gradual Disappearance of Jane Ashland, while complex and psychologically thrilling, is also very funny. For this, much credit goes to translator Anna Paterson as it is easy to lose the humour in transit. Okay, so the narrative begins with a brief glimpse of our protagonist, the eponymous Jane, possibly about to freeze to death in a tent in the middle of nowhere, which is hardly cause for laughter. But we quickly move on to Jane on a plane to Norway some time earlier, heading to explore the lands whence her family came to the USA. She reveals to the man sitting next to her that she’s from Wisconsin. He’s called Ulf (which alone sounds quite amusing in English), and hilariously cannot believe she has not heard of the Wisconsin Glacial Episode. ‘The Wisconsin Glacial Episode? Some 70,000 years ago?’ he persists. He’s a bore on the subject of musk oxen too, but he’s apparently quite hunky in his red checked flannel shirt and he’s company, so she ends up sleeping with her head on his shoulder, and accepting his phone number when they part at the luggage carousel, ‘just in case’. We know they’re going to meet again, and they do (hence the expedition into an icy equivalent of the outback, in search of, you guessed it, musk oxen). So Disappearance is a romance? Of sorts, yes, but it’s not Ulf whom Jane loves, but Greg, her teenage sweetheart whom she marries and with whom she has a beautiful child, Julie. So where’s all this leading, and why and how is Jane disappearing? Houm shares with us the process, but only at the very end reveals the cause, though there have been glimpses along the way. It’s clearly something very bad, because Jane has been in therapy, the ‘core of her being’ shattered, and takes refuge regularly in the shower or the car, ‘the only places nowadays where people can scream out loud or wail wordlessly’. The event, whatever it is, has made her ‘fearless’, which means she’s not afraid to set off out into the world and say what she thinks – for which read ‘offend people’ including, cue further black humour and heartbreak, the distant relatives in Norway whom she traces and who so kindly welcome her into their home. Yet, while we laugh with and at Jane, and while she can be maddening (for goodness sake, Jane, give up the cigarettes!) our hearts go out to her, because she is feisty and bold and has clearly suffered a heartbreaking trauma which has caused her agonies. 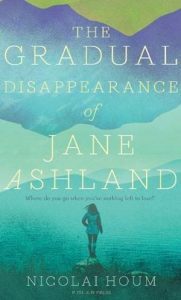 Like a limb returning to life after becoming ‘dead’ or numb from our sitting too long in an awkward position, Jane’s rejoining the land of the living is exquisitely painful. We are at the same time sympathetic and deeply curious about the outcome.